I read this article and found it very interesting, thought it might be something for you. The article is called One In Four Children In Indian Cities Malnourished. Poverty Isn’t The Only Cause and is located at https://archive.indiaspend.com/indias-great-challenge-health-sanitation/one-in-four-children-in-indian-cities-malnourished-poverty-isnt-the-only-cause-67137. New Delhi: One in four children in India’s most populous cities was malnourished, and mother’s education, feeding patterns and government service delivery determine child nutrition in addition to household wealth, according to a new report. Even as India becomes highly urbanised, 22.3% of children under five were stunted, 21.4% were underweight and 13.9% were wasted in ten most populous cities of India, showed the Urban HUNGaMA (hunger and malnutrition) Survey report 2014, released on February 7, 2018, by Naandi Foundation, a Hyderabad-based non-profit. While children in the highest stratum of household wealth were less prone to being malnourished, children in the lower strata had higher rates of malnutrition, the survey showed. The survey was conducted to assess the nutrition status of children aged 0-59 months living in the ten most populous cities of India where more than 12,000 mothers were interviewed and heights and weights of more than 14,000 children aged 0-59 months were measured. Cities included in the survey were Mumbai, Delhi, Bengaluru, Hyderabad, Ahmedabad, Chennai, Kolkata, Surat, Pune and Jaipur. Together, they account for 5.3% of India’s population and 4.1% of the child population aged 0-71 months. In the 10 cities surveyed, 94.4% of children were born in hospitals while 88.6% were weighed at birth and 37.1% of mothers had a cesarean delivery. “Poor infant and young child feeding practices, compounded by the poor status of women, the prevalence of household poverty and lack of government service delivery centre seem to be three major drivers of stunting among urban children” said the report. Prevalence of stunting and underweight in Indian cities was highest between the third and fourth year of life, data show. As many as 14.7% children aged 0-5 months were stunted, according to the survey. Breast milk alone takes care of child’s nutrition in the first six months. The transition from breast milk to family foods known as complementary feeding is a vulnerable period. 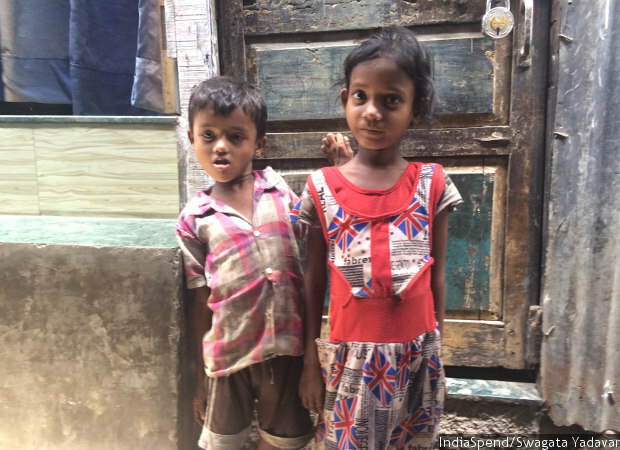 Only 1 in 10 Indian children gets “adequately fed”, IndiaSpend reported in May 2017. Nearly 22.9% of children aged 12-17 months were stunted, and the prevalence rose to 25.7% among children aged 36-47 months. The rate dropped to 21.3% for children aged 48-59 months, data show. Similarly, 17.3% children aged 0-5 months were underweight while the prevalence rose to 23.3% for children aged 48-59 months. The prevalence of wasting remained fairly steady between 13% and 16% throughout the first five years of life, while prevalence of overweight remained between 1.7% and 3.6%. Children of mothers with little or no schooling had higher prevalence of malnutrition, the survey showed. The prevalence of stunting among children whose mothers had five or less years of schooling was 35.3%, compared to 16.7% among children whose mothers completed at least grade X. Similarly, the prevalence of underweight among children whose mothers had five or less years of schooling was 33.1%, compared to 16.1% among children whose mothers completed at least grade X. The prevalence of overweight was 3.2% among children whose mothers had five or less years of schooling, compared to 2.5% among children whose mothers completed 10 or more years of schooling. A child born to a mother who can read is 50% more likely to survive past five years of age; each year of mother’s schooling decreases the probability of infant mortality by 5-10%, IndiaSpend reported in March 2017. Only 37.4% of the households surveyed accessed a public distribution system outlet in the month preceding the survey–lowest in Surat (10.9%) and highest in Kolkata (86.6%). As a result, less than one in four children (22.5%) was fed a diet that meets the minimum requirements for healthy growth and development, the survey showed. Only 53.9% households had piped water in their homes, the survey showed. However, 91.1% of households in urban India have an ‘improved drinking water source’, according to National Family Health Survey, 2015-16 (NFHS-4). The burden of drawing water for drinking often falls to women, leaving them with little time to focus on their health and education, studies (see here and here) show. Only 44.7% of households surveyed had one woman member with a savings bank account, the survey showed. Women who independently use a bank account also have greater say in household decision-making, thereby improving maternal and child health, according to this August 2015 study. As many as 61% urban Indian women had a savings account that they themselves used, according to NFHS-4.